THREE ANNIVERSARY’S AND A REFORMATION DOUBLE PLAY! 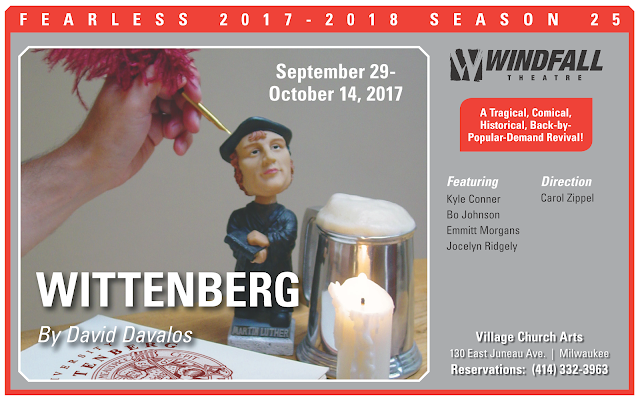 Windfall Theatre celebrates its 25th Season of bringing Fearless theatre to Milwaukee audiences with a REFORMATION DOUBLE PLAY that includes a back by popular demand revival and a powerful reading of a Tony & Olivier Award winning masterpiece. Each of these productions exemplifies Windfall’s mission of staging little known gems from renowned theatrical artists, original works from emerging local playwrights and selecting bold theatrical ensemble driven pieces that give our audiences unforgettable theatrical adventures. The REFORMATION DOUBLE PLAY also gives a nod to the 50th anniversary of Village Church where Windfall has been in residence for 25 seasons & to the 500th anniversary of the Reformation featured in the plot of each play. A Tragical, Comical, Historical! Back by Popular Demand Revival! The fall semester at Wittenberg U finds Hamlet Prince of Denmark class of 1517 with an undeclared major. His philosophy professor Dr. John Faustus has finally decided to marry his paramour, a former nun turned courtesan, and his theology professor Martin Luther is dealing with the spiritual and medical consequences of his outrage at abusive practices of the Church. Hysterically funny and poignantly touching the play takes the fictional characters of Christopher Marlowe’s Faustus and Shakespeare’s Hamlet and throws them together with the renaissance religious reformer Martin Luther and places the three of them on the campus of Wittenberg U to hash out their theories about the mysteries of the universe, existence, women, love and God. Kyle Conner as Hamlet and Jocelyn Ridgely as The Eternal Feminine. I bought this watch for my dad on this website on Father's Day.fake rolex watches for sale This watch has been bought since my father has been wearing it. It has been running and working very hard.fake rolex datejust The key is that it looks no different from genuine and the design is perfect. He likes it very much.